Amongst the many herbs I grow on my allotment plot, the Circus Garden, there is always space for coriander (cilantro), which I sow from seed saved from the previous year’s plants. It is one of the oldest culinary herbs, with records of its use in ancient Greek, Egyptian and Roman cooking. Saving seed to sow again the following year in this way is a natural and traditional activity, although it is also increasingly under threat as big business, supported by government bureaucracy, continues to extend its reach into every single activity associated with food production. In recent years this has meant three global companies – Monsanto, Bayer and Syngenta – being allowed to buy up the “patents” of nearly 70% of the world’s seeds varieties. I must confess that I find the whole concept of “seed laws” deeply disturbing. It represents an attempt to regulate and police an activity that the human race has been carrying out ever since we first started growing food. Earlier this year there was an attempt by the European Commission to further restrict the activities of those, like me, who save and swap seed from year to year. Under a proposed new regulation – the Regulation on Marketing of Plant Reproductive Material – every single variety of vegetable seed would have to be registered on an “approved list”. Any vegetable seed not on the “approved list” would become illegal to sell and, in the initial draft of the proposed new regulation, it would be illegal even to exchange that seed. Although the worst aspects of the EC’s proposals have since been modified, thanks to a concerted campaign by plant and seed charities, led by Garden Organic, it is safe to say this is probably only a temporary respite. Any company intending to sell seeds is already required to pay a registration fee of several thousand pounds for each variety it wants to sell – peanuts to the likes of Monsanto but prohibitive for smaller seed companies selling organic heritage and heirloom seed varieties to a much smaller market. Inevitably, the cost of annual registration of seed varieties is encouraging a situation where only the most commercially attractive seeds get registered and therefore become eligible for sale. Ironically, the seeds that prosper most under EU seed laws are F1 hybrids produced by the giant seed companies. These are not even “true seeds”, in the sense that they cannot be saved and replanted from one year to the next, but they are big business because their hybridised properties are popular with large-scale farming concerns. There is every chance the EC will try again to further tighten the restrictions on small-scale growers. The more paranoid amongst us anticipate that, with a new intake of MEPs yet to find their feet, the Commission may use the opportunity presented by last month’s European elections to push through tighter legislation. If such legislation comes in then we face the prospect of losing many wonderful varieties of seed, which are part of our rich and diverse organic cultural heritage. It is vital for all our futures that the seeds we sow and plant in our gardens, small holdings and on our allotments are exempted from any legislative restriction, so that those of us who are growing food in the traditional manner, without genetic modification, hybridisation, artificial fertiliser, pesticides, fungicides, herbicides or any of the other horrors that the giant seed and chemical companies relentlessly push onto the market, can continue a centuries-old, natural and increasingly vital tradition. In this dish I have combined some greenhouse grown Circus Garden coriander with chilli, lime and pistachios to make a lovely, vibrant dressing. The halloumi is gently cooked in buttermilk using a sous vide water bath. This provides a steady, even temperature over a prolonged period, transforming the halloumi is into a soft, creamy delight. If you don’t have a sous-vide water then it will not be possible to replicate exactly the effect of water bath cooking, but you can obtain an approximation by heating 500 ml of buttermilk in a pan very gently over a low heat for a couple of minutes, until it is just hand hot, and then pouring it over the the halloumi slices in a bowl. These then need to be left to steep for several hours, preferably overnight. Of course, for a super-quick version of this dish you could simply forget everything you’ve just read about buttermilk and water baths and just flash fry slices of halloumi and drizzle them with the dressing. Texturally it won’t be the same, but it will still taste great. 1. Preheat sous vide waterbath to 65°C. 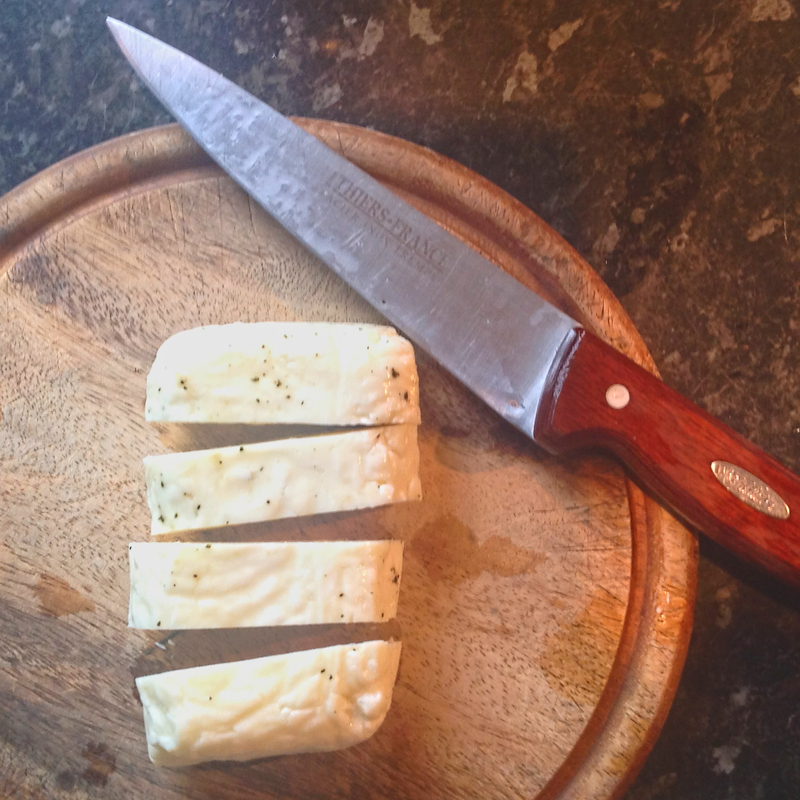 Place three slices of halloumi into a sous vide pouch, along with one tablespoon of buttermilk and one slice of lemon. Vacuum seal the pouch. Repeat this until you have four sealed pouches. 2. When the waterbath has reached the correct temperature, place the pouches into the water and leave to cook for 90 minutes. 3. In the meantime, make the dressing. Place the pistachio, coriander, lime juice, maple syrup, olive oil and chilli into a blender and process to a smooth paste. Set to one side. 4. After 90 minutes, remove the sealed pouches from the waterbath. Leave to cool until you are able to handle them. Open the pouches to slide out the slices of halloumi. 5. Heat the olive oil in a large frying pan or skillet over medium heat. When hot, add the butter and stir. As soon as the butter has melted, place the halloumi pieces in the oil and butter. Cook for just 90 seconds on each side, so that the halloumi is lightly browned. 6. Serve hot, alongside a simple salad and drizzled with the coriander, lime and chilli dressing. Seed swapping is so much more than just an exchange of seeds – it’s a great opportunity to meet other growers and swap ideas… and it saves money. Hard to think of that becoming an illegal activity. Never mind the loss of heirloom varieties with all their history and cultural significance. On a lighter note, your coriander dressing sounds very good and, with halloumi being one of the few cheeses we all eat here, it’s a recipe I’ll be coming back to. Thanks for your comments. The ability to swap seeds, in this era of increasing regulation and commercialisation, is now the only way to keep some varieties from extinction. The more of these heritage varieties we lose, the less overall plant diversity we have – a crazy proposition when we know that we also face the uncertainties of climate change. Hi Ann, and thanks for your comments and feedback. I am sure you’ll like this recipe, and I’m pleased to hear the chickpea cakes were a success.